October 13th will see a national conference ‘Resisting the Market’ hosted by the London Region University and College Union (UCU) involving a number of networks and groups in the UCU including the UCU Transformed, the Branch Solidarity Network and the UCU Left group. Other than the latter, which is a long standing leftist caucus, these grassroots networks are a product of the fight against changes to the University Superannuation Scheme (USS) which took place earlier this year. 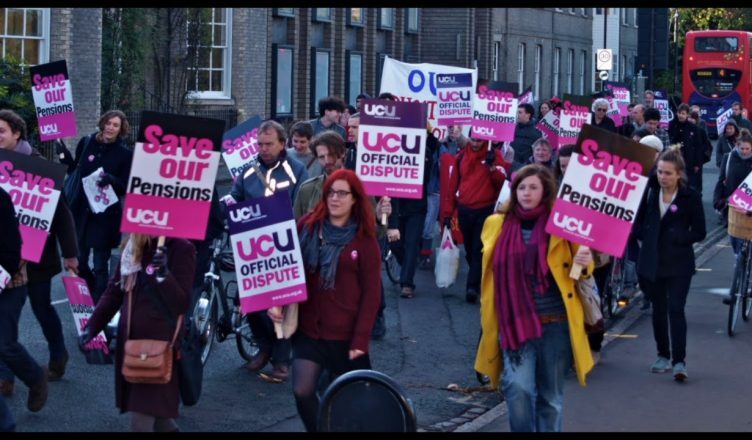 This fight, which the UCU leadership did everything to contain, saw an outpouring of activity at a Branch level unseen for many years as academic and professional UCU members took initiatives and linked up through unofficial networks, generally bypassing the official union structures. The level of engagement took not only the union’s leadership but also local branches by surprise. In part this was because previous industrial action called by the UCU had been so pathetic and demoralising. The enthusiasm and imagination shown was unprecedented, with some UCU Branches inviting other unions and students to join their strike committees and a conscious reaching out in some areas to grassroots unions such as the United Voices of the World in London and the Scottish Couriers Network in Glasgow. However, whilst all this was encouraging and led to a resounding rejection of a contemptuous ‘deal’ pushed in the middle of the strike, the reality was that the struggle was not extended to include even some workers with USS but in other unions and the impact was not maximised. The offer from the employers to set-up a Joint Expert Panel (JEP) which will look at 2017 evaluation of the pension scheme was accepted by the membership but only postpones the inevitable Round Two of this fight. And the need for organisation for that fight is what the national conference is, in part, what needs to be developing. Ultimately, it will require the rank and file to self-organise the struggle, to strengthen and develop the networks of resistance and take control. Simply replacing the leadership, which has been the main focus of the left in the past, is not enough. Time and energy wasted trying to ‘reform’ the union will be better spent trying to build an autonomous and independent rank and file movement which goes beyond the UCU and encourages all University workers regardless of grade, role or status to resist the the attacks of the employers.